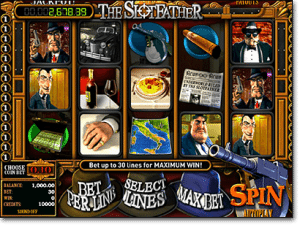 If you love Italian mob movies like The Godfather and Goodfellas, The Slotfather is sure to become one of your favourite online pokies. BetSoft has created a parody of The Godfather in perfect 3D pokies form, filling the reels with beautiful classical music to accompany the shootings and criminal activity of the flawlessly clichéd gang members. Set in the Italian restaurant which is their regular hangout, join the Slotfather and his mob of goons as they set out to score as much cash as possible, congratulating you on your successes with their thick accents. Using the smallest coin size and one active payline, the minimum bet is $0.02, while activating 30 paylines with the larges coin size brings the maximum bet to $150.00 per spin. To place the highest bet possible, just hit the ‘max bet’ button (note this will need to be in place in order to win the progressive jackpot). An auto-play feature also allows you to automatically play up to 100 spins at your desired bet level. The Slotfather is available to play at our recommended casinos in instant-play mode, and you can also try it for free in demo mode to get a feel for the game before handing over any of your own money. Underboss Scatter – receive three or more Fat Gangster (the sloppy looking guy in the blue suit) symbols anywhere across the reels to trigger the Underboss Scatter, and the word scatter will appear on each of these symbols, turning them into scatter pays. Scatter pays are equal to the line pay of the standard scatter and multiplier by the percentage of active paylines. Sneeky Instant Win Bonus – the Sneeky Instant Win Bonus is triggered anytime the Sneeky Gangster (the skinny guy with wiry glasses) lands on either side of the suitcase symbol on lines one, two or three. When this happens, the Sneeky Gangster will reach out to steal a wad of cash from the nearby suitcase, awarding his stolen funds right into your bankroll. Multiplier Mob Free Spins – free spins are triggered by an appearance of the Old Gangster (the suave looking, gun wielding guy with fancy hat) on either side of the tommy gun symbols on reels one, two or three. When activated, the Old Gangster grabs his gun and starts shooting bullet holes all over the screen. A message will come up asking you to choose a bullet hole to reveal the number of free spins and multiplier you’ll receive. This bonus gives you anywhere from three to 10 free spins with a multiplier of 1X or 3X, along with a guaranteed 30 credit bonus. The Slotfather Bonus Round – land three or more Slotfather symbols (the important looking guy smoking a cigar) on any active payline to activate this huge bonus game. Here you get to help The Slotfather by choosing where he should place his slot machines in various establishments around the city. 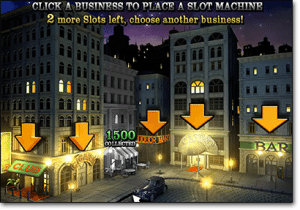 You’ll be asked to choose three out of six buildings, and the total revenue earned on the slots within that building will be credited to the bonus earnings indicator. After, you’ll be transported to the Slotfather’s favourite Italian restaurant where the mob will congratulate you on a good job by awarding you your payout, with all earnings from the slot machines going straight to your casino account. With so many bonus games waiting to be triggered, it’s easy to forget this is a progressive jackpot pokies game. The progressive jackpot can only be triggered when the maximum bet is in place, and will be awarded if you manage to land five of The Slotfather symbols anywhere across a winning payline. The current value of the progressive jackpot is updated in real time at the top left hand corner of the reels, so you always know how much you stand to win. Click the links above to sign up for a new account and you’ll be rewarded with welcome packages giving you a boost on your first deposits and free spins. Other fun BetSoft pokies to try include Mega Glam Life, Rooks Revenge, Under the Bed, At the Copa, Mr Vegas, Paco & the Popping Peppers and Weekend in Vegas. The real question is what’s not to love about The Slotfather – and the answer would be nothing. This game is up there with the best of them, for everything from the exquisite animation to the innovative bonus features. You don’t have to be a fan of mob movies to love this game, BetSoft has pulled it off in such an entertaining way each spin will leave you hanging to see what the gangsters will do next. This is one of those well designed pokies which makes you forget you’re even playing a casino game, until suddenly you realise you have racked up a stack of cash along the way. A must try for all online players.